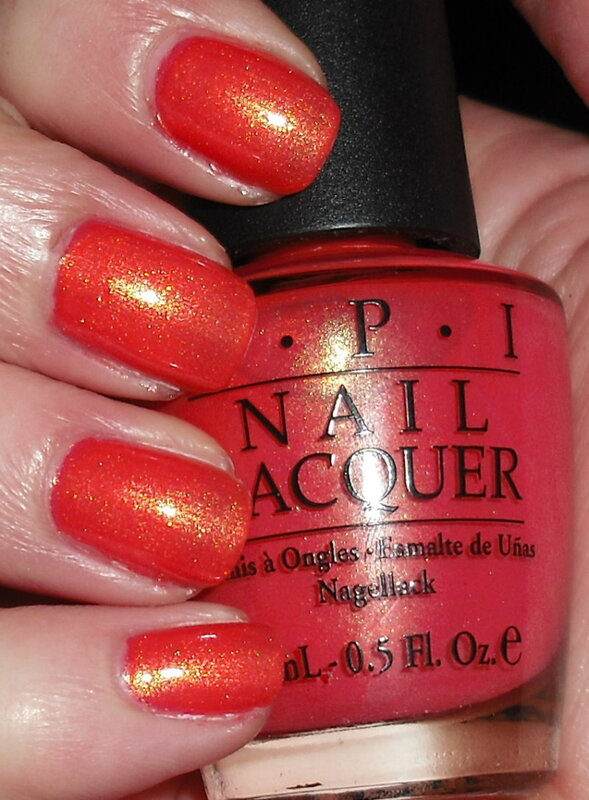 Today, I have an OPI lemming I recently fulfilled. It's not an HTF color, just one that had been on my wishlist for awhile and I finally got around to getting it. Bright Lights Big Color is a coral-orange with gold shimmer. Gold shimmer, yep that's all it takes for instant love for me. Fun coral shade. If coral is your think you'll like this one. Happy Please Don't Let Steph Get Sick Thursday! This one is so pretty. And I love that you refuse to be sick...I really do think that with stuff like colds, you can keep them away with the power of your mind. LOL. Some good-health vibes coming to you over the internet! Hope the cold stays away! This is a lovely color! I will definitely have to put that on my to buy list. It's beautiful! DON'T GET SICK. I am jealous you're having an orlando blogger meet up, I really need to pack up and move to FLA.
Aww, from one sickie to a potential sickie, please don't. Ugh. Love that color, though. I love anything with strong golden shimmer!